The Mantissa Destination™ Machine Control System is a full-featured PC-based control system offering high performance and flexibility. Industrially hardened distributed I/O elements are integrated into a workstation PC that uses a graphical user interface (GUI) front end, providing a user-friendly interface to the sortation controls. The workstation interface provides the operator with the ability to monitor system behavior, create assignments or change sorter parameters while refraining from involvement with the logic’s internal workings. Control of automatic induction equipment to properly position product on trays. 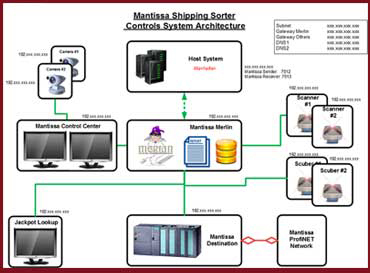 The Mantissa Destination Sortation Controller can be separated into four broad functional modules or subsystems; the PC/Operating System Platform; the GUI Man-Machine Interface; the Real Time Run Time Engine and the Distributed I/O Hardware. The operating system selected for the Mantissa Destination Sortation Controller is Microsoft’s® Windows platform. Microsoft designed Windows to be a robust, reliable platform for a wide range of mission-critical applications. It is used in data servers, banking transaction processors, CAD/CAM systems and many other high-performance high-reliability applications. While perfectly satisfactory is its own right, to achieve a better real time response, the version of Windows, Mantissa Corporation supplies contains the widely supported VenturCom real time extensions. These extensions provide faster scan times with less variation between scans. 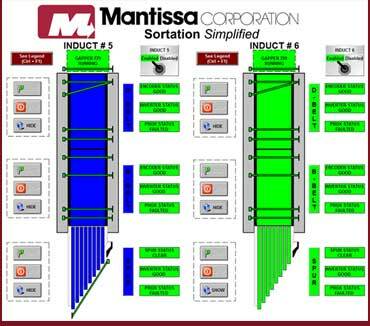 The operator interaction with the Mantissa Destination™ Control Software is through a “Windows®” based GUI. Leveraging on the strengths of the world’s most widely known operating system brings a comfortable and intuitive feel to the operating screens. 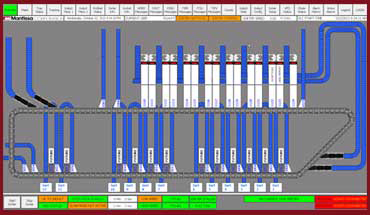 Each screen is designed to provide real-time information on the health of the system such as current running status, host connection state, chute jams, E-Stops, device actuation and high/low speed alarms. As the GUI Man-Machine Interface interacts with the external world, the Real Time Run Time Engine interacts with the machine control of the tilt tray sorter. This module is the heart of the sortation control. Developed by Mantissa Corporation, this software application compiles down to an extremely fast running, high performance module that runs independently of the other task. 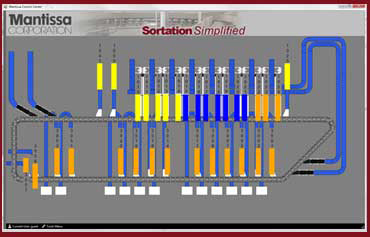 Total sortation control comes from this module. Tray tracking, tray tipping, chute full inputs, tip verification, tray empty/full sensing, etc. is all accomplished at this level – quickly and efficiently. The Distributed Input/Output Hardware System provides the medium by which the PC Based Control System can actually read individual input bits from photo and inductive sensors and turn on individual devices such as (tipper) solenoids. The PC uses distributed I/O that is in the direct vicinity of the automated process with a powerful field bus (local area network) as the communications link between the CPU and the I/O. 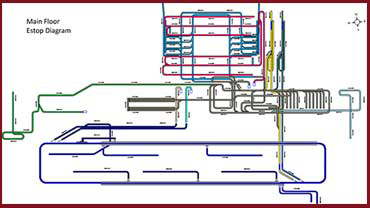 The field bus is PROFIBUS-DP, comprised of an I/O scanner card, a single two conductor thin fiber optic cable and distributed Input/Output modules. This system can control on a single channel up to 3,200 configurable points. 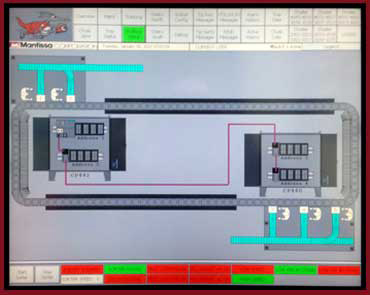 Additional screens provide maintenance information that facilitates troubleshooting of the sortation system. Built in diagnostics allow the tipping of individual trays or groups of trays in a predefined manner. 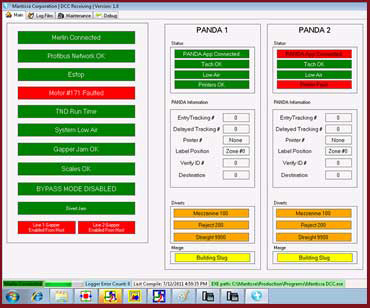 Other diagnostics test and display the workings of serial devices and/or networking devices. A Host Service TCP/IP emulation is provided for complete troubleshooting of the entire system off line.